The Google Pixel 4 XL has surfaced on Geekbench for the first time to reveal its hardware specs. The Geekbench listing of the Pixel 4 XL reveals that it will be arriving with only 4 GB of RAM. Various smartphone OEMs have launched flagship phones with increased the amount of RAM. Lenovo Z5 Pro GT, Samsung Galaxy S10+, Xiaomi Black Shark 2 gaming phone, Mi 9 Explorer Edition and Vivo iQOO Monster edition are some of the smartphones that feature 12 GB of RAM. 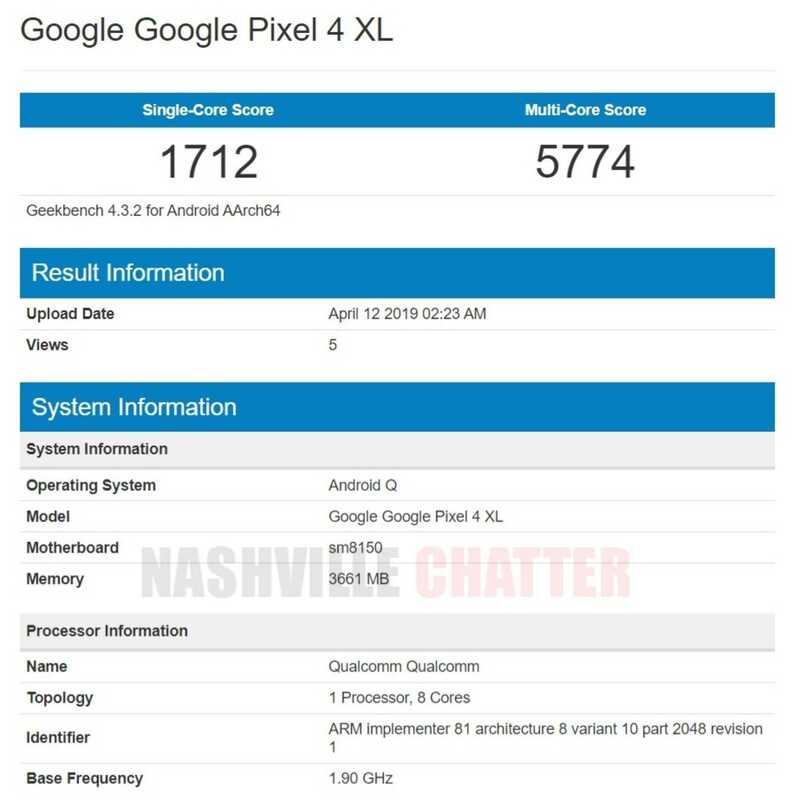 The Google Pixel 4 XL Geekbench appearance suggests that it is fueled by Snapdragon 8150 which seems to be the Snapdragon 855 mobile platform. It is running on the yet-to-be-announced Android Q OS. In the single core test of Geekbench, the Pixel 4 XL has scored 1712 points. In the multi-core test, it has recorded 5774 points. The benchmarking scores are very low for a Snapdragon 855 powered phone. It could be probably because of presence of 4 GB of RAM. A new leak has revealed that the Pixel 4 and Pixel 4 XL phones are respectively codenamed as Coral and Flame. In January, Google Coral (Pixel 4) was spotted with 6 GB of RAM. Hence, the Pixel 4 XL could be also arriving with the same amount of RAM. Hence, the Geekbench listing that has appeared today could possibly be erroneous. The original Pixel phones from 2016 that were powered by Snapdragon 821 SoC featured 4 GB of RAM. These days it is quite normal to see budget-friendly phones with 4 GB of RAM. Hence, it will be disappointing to see Pixel 4 duo arriving with same amount of RAM. The Google Pixel 4 series is expected to go official in October this year. Before the arrival of Pixel 4 phones, the search engine giant is expected to announce the Pixel 3a and Pixel 3a XL mid-range phones in this quarter.